Croatia has made progress in some relevant rankings measuring competitiveness, when it comes to conditions for doing business, Regional Development and EU Funds Minister Branko Grcic said on Tuesday. This is how he responded when asked to comment on a report of the World Economic Forum (WEF), carried by some media, which listed Croatia among countries with the least efficient governments. Saying he still has not had an opportunity to look at the WEF report, Grcic said that in some other, very relevant rankings such as the World Bank's Doing Business report, Croatia had moved up by 25 positions. "This is also, most definitely, a result of the work of this government," Grcic told the press The Doing Business report, in which Croatia's ranking is relatively good, is widely accepted, Grcic said, adding that in his opinion Croatia would make progress in this year's report as well. Some local media reported on Tuesday that the Croatian government was among the least efficient governments in the world, citing the latest WEF report. The media were citing a subindex called "government efficiency," which is an integral part of the Global Competitiveness Index, which WEF released in September 2014. In that report, Croatia is ranked 77th of the 144 countries according to the Global Competitiveness Index, and the second best ranked country in Southeast Europe. According to the government efficiency subindex, Croatia was ranked 139th. The report, however, stressed that Croatia had a good infrastructure, as well as benefits from a relatively high level of education. The report also notes that Croatia is open to foreign trade cooperation, has low customs tariffs and good customs procedure. According to the report, Croatian companies and citizens use information and communications technologies much more than its neighbours in the region. Paul Muggeridge of WEF released on the forum's blog on Monday the lists of the most and the least efficient governments in the world, citing WEF's last year's figures on competitiveness, namely the government efficiency subindex. According to him, the most efficient are the governments of Qatar, Singapore, Finland, Hong Kong, the United Arab Emirates, New Zealand, Rwanda, Malaysia, Switzerland and Luxembourg. The least efficient are the governments of Venezuela, Italy, Argentina, Lebanon, Libya, Croatia, Angola, Chad, Mauritania and Serbia. The World Economic Forum's annual Global Competitiveness Report evaluates the efficiency of 144 of the world's governments on measures including the wastefulness of government spending, burden of regulation and transparency of policymaking, to produce an overall global ranking. An over-sea bridge linking southern Croatia to its northern tip across the Adriatic Sea could start being built by the end of the year, in a move that has powerful historical and political resonance for the region. At the moment, driving by car from Dubrovnik up along the coast to the Croatian capital of Zagreb sees you forced to exit Croatia and enter Bosnia and Herzgovina (BiH). Just 20 kilometres later, after passing by Neum, BiH’s only coastal town, you are back in Croatia again. After having queued to get through two border checks. This BiH corridor means that Croatia is split into two non-contiguous parts. This split was a long time in the making. 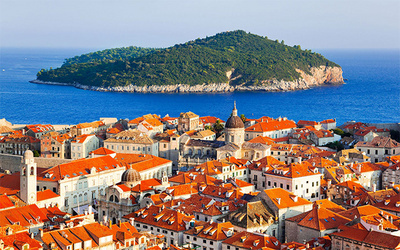 Croatia itself has had a long and turbulent history and for much of it was divided into several parts, one of which was the Republic of Dubrovnik. This was an independent country with its headquarters in Dubrovnik itself, a medieval city famous for its beauty (and now even more famous for having parts of TV series Game of Thrones filmed there). It was a small republic, but with an exceptional naval force in the Mediterranean from 1358 to 1808 and the arrival of Napoleon’s troops. However the bigger problem for the Republic was a powerful neighbour to the east, behind the hills. The Ottoman Empire was keen to get its hands on Dubrovnik. Deft diplomacy as well as an annual payment of gold coins brought Dubrovnik its freedom. Eventually however, the Ottoman Empire managed to outplay Dubrovnik and obtain access to the Adriatic Sea. It was and is a narrow corridor which during the formation of Yugoslavia became a part of Bosnia and Herzegovina, and so divided Croatia’s mainland. After the breakup of the former Yugoslavia "Neum corridor" was not a big problem partly because that part of the BiH is inhabited by Croats. Nevertheless the grandiose idea of a bridge that would avoid this corridor was mooted in 1997 – and with it the political bickering about whether it would be either feasible or affordable (costs are estimated at around €260 million). The other problem was the BiH government which said the bridge would be an obstacle should it ever decide to build a port in the city of Neum. In 2005 things started to move. BiH dropped it opposition and the then Croatian PM Ivo Sanader announced the start of construction (all seemed possible in the economic boom of the time). But work stopped almost immediately. During the financial crisis there was suddenly not enough money for a bridge that is planned to be 2,400m long, 21m wide and 55m high above the sea. By 2012, the centre-left government cancelled the project and started listing alternatives such as ferries or an underground tunnel. As idea after idea fell by the wayside, the government changed its mind back to the Peljesac bridge – named after the country’s southern peninsular. The Economic and Social Council met on Monday to discuss ongoing negotiations between the European Union and the United States on the Transatlantic Partnership (TTIP), concluding that it was necessary to carry out a study to assess its impact on the Croatian economy. Damir Kustrak of the Croatian Employers' Association (HUP) said that this was necessary although all the details of the agreement which was being negotiated were not known yet. It is not known whether it will be an EU agreement or a mixed agreement subject to approval by the national parliaments of EU member states, he said. Croatian member of the European Parliament Biljana Borzan said that the agreement could be a historically good one and bring a lot of benefits, but if poorly negotiated it could also cause a lot of damage. That's why the European Parliament is exerting pressure on the European Commission and has given it guidelines in a resolution so that "we wouldn't bang our heads against a wall when it's too late," she said. The 10th round of TTIP talks began today and we will be able to see how the agreement may influence the economy of each member state. Initially there were fears that living standards and environmental standards would be lowered and it would adversely affect labour rights, and now there is fear of the so-called ISDS (investor-state dispute settlement) which allows multinational companies to sue a state if it has passed a law that threatens their profits. Since no agreement has been reached on the matter, Parliament President Martin Schultz has proposed a compromise solution that would allow making a complaint and that such disputes should be dealt with by international courts, Borzan said. Deputy Foreign and European Affairs Minister Josko Klisovic said that Croatia wanted to improve the current balance of TRADE AND INVESTMENT by adsupply" "> relations with the US, adding that the TTIP was a partnership agreement and that the transatlantic partnership was extremely important for Croatia. The government will insist that this agreement brings benefits to EU citizens, boosts growth and employment, improves the purchasing power, increases and accelerates the investment cycle, improves the competitiveness of the economy, increases trade in the EU's favour, reduces administrative barriers, standardises regulations and procedures, and maintains the existing standards, he said. Trade union leader Vilim Ribic said that the trade unions had too little information to able to say whether they were in favour or against the agreement. He quoted Nobel Prize winner Joseph Stiglitz, an adviser to US presidential candidate Hilary Clinton, as saying that this was neither a trade agreement nor a partnership agreement and could not produce expected effects because that could be achieved only by removing customs barriers, which have for the most part already been lowered. Ribic warned that the question was who would make critical decisions and whether national parliaments were free enough to adopt national policies or multinational corporations would be above the state. What I can tell you, do not forget that this is an election year. After each four-year period, new promise come, and old projects will be forgotten. Any change of parties in power, brings the "skeletons in the closet", accusations against the losers and the movement from the beginning. Reform started to interrupt, because, of course, the new government has its own vision. Peljesac Bridge is a perennial utopia. It becomes topical as elections approach. Joining the EU has brought only the outflow of young people, because the economy has nothing to offer for the European market. Factories were destroyed by privatization in the 90s. Public-sector unions are the main obstacle in the implementation of reforms and the reduction of the state apparatus. Civil servants have their own labor law (should I say that far more favorable than for employees in the private sector) and they are virtually protected from getting fired. By the way, government officials in Croatia were named the most inefficient in the world. So, let us wait for the elections.